7710NAW3 Armless Inside Curve Two Seat Sofa Standard Back Right Power. 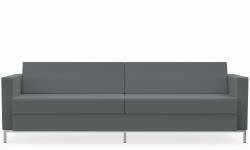 2 x 7710NA Armless Inside Curve Two Seat Sofa Standard Back. 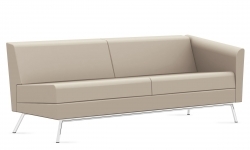 7711NA Armless Inside Curve Two Seat Sofa High Back. 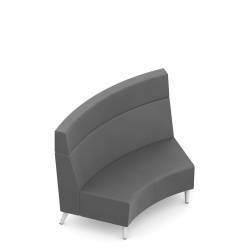 Allante, Bisque (A42E) headrests/seats and Momentum Odyssey, Rue (OD53)backs with Tungsten (TUN) legs. 7739W4 Inside Curve Wide Wedge End Table Rear Power. White Chocolate (WHC) with Tungsten (TUN) legs. 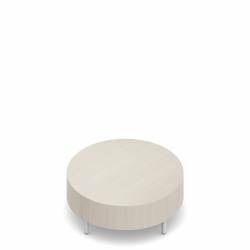 7735W2 42" Diameter Round Table. White Chocolate (WHC) with Tungsten (TUN) legs. Bring people together in a place where ideas, insight and inspiration can be shared. River supports an endless array of curvilinear and rectilinear configurations with three back heights and benches. Seating and tables can be specified with power and USB outlets for mobile devises. An optional HT construction lets River overachieve in high traffic, high demand environments such as airports and universities. 3363R Three Seat Sofa, Right Arm and 3363L Three Seat Sofa, Left Arm. 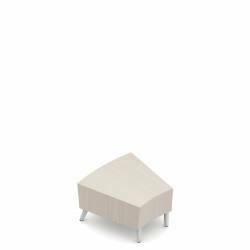 Allante, Light Parchment (A31E) with Chrome (CHM) legs. 3882 Bridge End Table. Winter Cherry (WCR) with Chrome (CHM) legs. 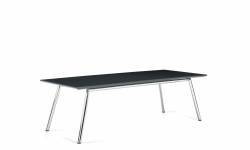 3880 Coffee Table. Winter Cherry (WCR) with Chrome (CHM) legs. Let's get connected or just catch up for a minute. 3361 Lounge Chair. 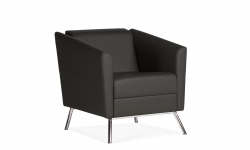 Contract Leather, Charcoal (D541) with Chrome (CHM) legs. 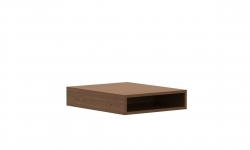 3357 Coffee Table. White (WHT) with Chrome (CHM) legs. 3363 Three Seat Sofa. Contract Leather, Charcoal (D541) with Chrome (CHM) legs. Reception station. Tiger Maple (TMP) with White (WHT) credenza top. Desk mounted, modular panel system. Glazed panels. Looking good from any angle. Here's one that you won't turn your back on or need to back up against the wall. Wind is a timeless look that you can bring to the front of any room. 7891 Three Seat Sofa, Left Arm and 7891R-LC Three Seater Right Arm Left connector. Spinneybeck Volo, Oatmeal (VL73) cushions and CF Stinson Outta Sight, Thistle (6464) with Tungsten (TUN) legs. 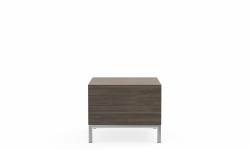 7786 End Table. Dark Espresso (DES) with Tungsten (TUN) legs. 7875 Lounge Chair. Spinneybeck Volo, Oatmeal (VL73) cushions and CF Stinson Outta Sight, Thistle (6464) with Tungsten (TUN) legs. 7789 Square Coffee Table. Dark Espresso (DES) with Tungsten (TUN) legs. Modular is back in a slimmed down, tailored style. Citi sectionals offer efficient seating configurations where space is at a premium. 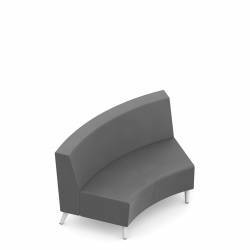 Sectionals are available in multiple seat configurations and feature integrated corners, armless units and table arms. 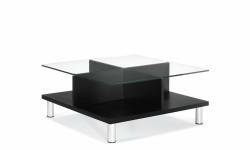 Coordinating coffee or end tables are available with tempered glass or laminate tops. 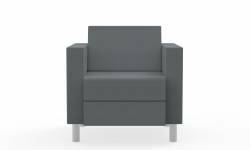 3372CRTL Club Chair with MDF Shelf. Right Tablet. Knoll Ransom, Captive (YOL9) and DesignTexCestino, Sterling (YV27) seat with White Chocolate (WHC) top. Working, waiting, or just taking a break. Sirena is a modern club style series with a great 'sit' for short stops or unexpected layovers. 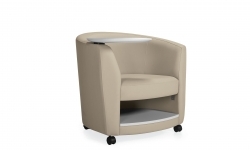 Tablets, storage and casters make it a versatile spec for any lounge or collaborative application. S7875FUC Single Seater with Arms. ﻿Allante Oxford (A47E) with ﻿Chrome (CHM) finish. 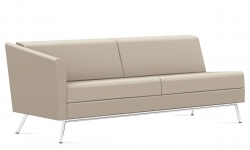 S7904FUC Four Seater Sofa with Arms. Allante Oxford (A47E) with ﻿Chrome (CHM) finish. 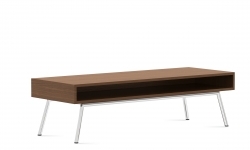 S7916 Rectangular Coffee Table. White Chocolate (WHC) with ﻿Chrome (CHM) finish. 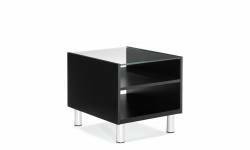 S7911W1 End Table with Power Module. ﻿White Chocolate (WHC) with ﻿Chrome (CHM) finish. An elegant presentation with timeless appeal. Our most popular lounge series goes uptown with a new metal frame design. An optional double width cushion compliments the new look, available on both the freestanding models and modular configurations. 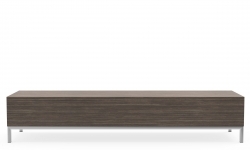 The new Citi Square tables are available with integrated power delivery and USB charging for mobile devices.